California hosts over 5 million utility poles and millions of miles of utility lines. California has the strictest utility pole safety rules in the country, yet has continually faced disastrous and deadly conditions. The California Department of Fire and Forestry (CalFire) traced 13 fires in 2017-2018 to PG&E’s maintenance and operation of its electric power lines and poles. Most of those fires were caused by vegetation coming in contact with electrical wires, downed wires, or in one case, utility pole failure. Utility poles usually fail because they are overloaded or have been weakened by termites, woodpeckers, or weather. The CPUC is investigating whether PG&E or other companies violated CPUC rules and standards. CalFire is still investigating the cause of the 2018 Camp Fire in Paradise and the 2017 Tubbs fire in the Santa Rosa area. During my six-year term as a CPUC Commissioner from 2011 to January 2017, and as a Law Professor at Santa Clara University since 2004, I repeatedly sounded the alarm about poor conditions on many California utility poles and lines. During utility pole tours I led in urban areas ranging from the Silicon Valley to Long Beach, and in rural areas from the Central Valley to Native American Reservations, we saw many leaning or downed poles and lines, and facilities that obstructed access to climbing space needed to repair electric lines. Four- to 5-foot long segments of old telephone poles known as “pegs” hung by rope and a few nails from many poles. “Buddy” poles with the bottom cut off were braced to new poles, adding dead weight while months and years passed before responsible entities moved facilities to new poles. Some companies strung wires to trees instead of utility poles. Vegetation near poles and wires was often overgrown. My CPUC colleagues and I ordered many of these conditions to be fixed, strengthened utility pole safety rules, and increased the authority of the CPUC’s Safety and Enforcement Division to hold electric, telecommunications, and Internet companies accountable for CPUC rule violations. Despite these efforts, the CPUC’s enforcement process remains hampered by antiquated information systems, spotty reporting of rule violations, limited enforcement resources, aging infrastructure designs and resources, and a system that tolerates rule violations that persist for years. I offer these regulatory principles to protect our communities, infrastructure, and state as we face wildfire threats predicted to increase with climate change. First: Modernize utility infrastructure management through Geographical Information System (GIS)-based data systems supported by artificial intelligence (AI). The CPUC should order companies with facilities on utility poles to create a GIS-based data system that uses AI to catalogue poles, attached facilities, wires (noting whether they are insulated or uninsulated), splices (particularly for electric wires), and to identify rule violations. A modern utility infrastructure information system supports rule accountability and enforcement, identifies wildfire and other risks, facilitates competition and access to utility pole resources, and fosters public safety. Several utilities have supplemented foot patrols of utility poles and lines with planes and drones that deploy LIDAR (light detection and ranging) to create 3D GIS-based maps that can identify hazards such as vegetation growing too close to lines. These maps should be integrated into the utility pole and wire database to generate action steps to address potential hazards. Second: Modernize infrastructure through smart poles, sensors, and AI-assisted vegetation management, particularly in high-risk areas. Wooden utility poles are largely based on Samuel Morse’s 1844 design used to support expansion of telegraph service. We need smart poles, made more fire and pest resistant, that inform the CPUC and utilities when the pole is overloaded, leaning, when an unauthorized facility attachment is made, or when nearby vegetation is growing too close. Communications technology can connect sensors and cameras attached to poles, substations, and utility facilities to AI-assisted databases to identify dangerous conditions and prioritize maintenance. Third: Enforce utility pole safety rules, informed by utility and public reports of rule violations. The CPUC should require entities that attach facilities to utility poles to promptly report violations of CPUC rules stemming from their own or other pole attachers’ facilities. Utility poles are a shared resource and responsibility. Violators should not be allowed to shift costs and risks to others by failing to observe the rules. The CPUC should facilitate and act on utility and public reports of pole safety violations. Fourth: Quickly learn from failures and near-misses. The CPUC and pole attachers should examine airline industry and hospital practices to learn from failures and adopt new rules as appropriate. We need to know not just that a utility pole failed in Lake County, causing a fire, but why it failed. The CPUC knows that vegetation management, conductors (electric wires), and spliced electric wires are top fire causes. The CPUC should consider prohibiting electric line splices and require insulated conductors in high-wildfire risk areas. The state of California must support the CPUC with necessary personnel, information technology, and databases to conduct and review safety inspections, enforce pole safety rules, and analyze safety incidents. Fifth: Facilitate localized electric grid shutoff and management through deployment of grid-based technologies, microgrids, and batteries. Utilities should deploy technologies that can interrupt electric current or prevent circuits from reenergizing after a fault to prevent downed wires from starting fires and isolate problem areas. Deployment of microgrids and batteries can facilitate isolation and control of at-risk areas and reduce risks associated with electric grid shutoff. Customers should be provided with education about shut-off protocols, including options for using batteries for critical facilities and needs. Six: Conserve water. Drought fuels wildfire danger as trees die and brush becomes tinder. The state of California and every Californian must continue to conserve water and switch to drought-tolerant landscapes and designs that mitigate water run-off and urban heat islands such as bioswales. As a CPUC Commissioner, I led the Water-Energy Nexus proceeding which adopted three CPUC decisions to reduce the embedded water in energy and the embedded energy in water. The CPUC has also been a leader in authorizing water recycling facilities and investment in water leak detection to prevent water waste. Seventh: Improve telecommunications reliability and adopt net neutrality rules. Communications and information technology are critical to energy and water system maintenance, operation, and safety, and to fire response and recovery. The CPUC must require more granular public reporting of communications system failures and outages. Utilities should invest in communications systems that can be quickly deployed in emergencies when other facilities fail. Net neutrality is essential to ensure that Internet Service Providers do not interfere with Internet access or distribution. Video is increasingly important to fire detection, reporting, and to sharing escape routes. Cell phones and hot spots are vital fire-fighting tools that connect first responders and utilities to GIS-based systems with information on wind, lightning, fire location, fire-fighting resources, at risk homes and businesses, available hospital beds, and utility infrastructure. Eight: Continue California’s Climate Change Leadership. California has been a leader in addressing climate change through its commitment to 100 percent renewable energy by 2045, and early achievement of its 33 percent renewable energy goal. California needs to continue its investment in innovative resources including batteries, renewables, and Internet-based energy demand reduction and management resources. The transportation sector is California’s largest contributor of CO2 emissions. The state should embed charging and internet infrastructure in roadways and create car-charging parking lots and bus stops. Enabling electricity access in areas lacking electric grid-access such as on many of California’s Native American Reservations and on farm fields will reduce diesel generator use, promote equity, improve health, and forestall climate change. Nine: Invest in forest and watershed management that reduces drought and fire danger. Removal of invasive species and preservation of forest health can offset carbon emissions, reduce fire dangers, and improve water resource productivity and management. Wildfires can emit more CO2 than a coal-fired power plant would during the course of a year, and release small particulates harmful to health and conducive to snow melt. Preventing wildfires curbs climate change. Ten: Adopt building codes to promote fire safety and energy efficiency. California should support work to comply with contemporary fire safety and energy efficiency building codes. California should tap its Greenhouse Gas Reduction Fund to support the transition to fire-resistant roofing and materials to limit wildfire CO2 emissions, protect people, carbon sequestration in forests, and property. Conclusion: These principles form a foundation to address increased wildfire risks associated with climate change, drought, and utility infrastructure. 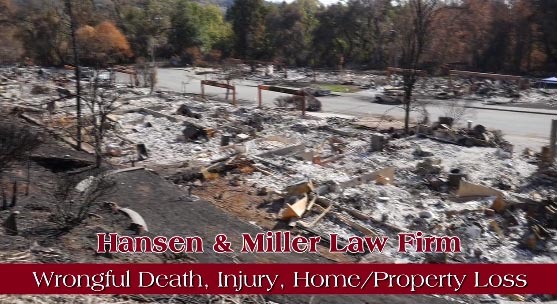 Wildfires put lives, property, and communities at risk, often harming vulnerable populations such as the elderly, disabled, renters who lack insurance that covers relocation costs, people with asthma and lung disease, and undocumented immigrants who fear government reprisal for seeking assistance. As the Camp Fire burned in November 2018, millions of Northern California residents breathed air tainted by unhealthy levels of particulates, while homes, schools, and businesses were also destroyed in Southern California fires. SCU’s president, Father Engh, wisely cancelled classes in the week before Thanksgiving to protect student and staff health. 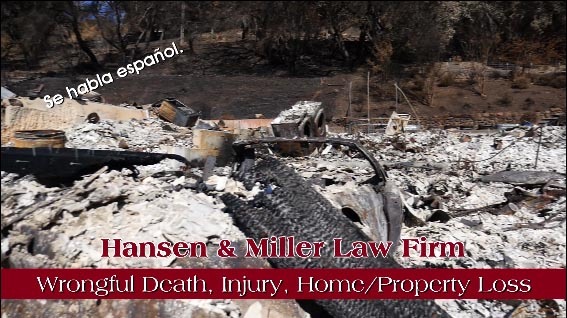 Stemming utility-caused wildfires is a legal and ethical imperative to protect the safety and health of the people of California, and the future of our state and planet.